Teshuvah, the belief and the mandate that we really can and must change… demands hard internal work because teshuvah requires good decision-making. The poet Robert Browning once bemoaned the difficulty of making decisions: “Life’s business being just the terrible choice.” But choose we must: every word we say, every small gesture, every action is a decision that has a causal impact on the next decision. …We repeatedly sin so we ask that God repeatedly forgive. But at this time of year, we ask that God give us the wisdom and strength to make good decisions so that our repeated pattern of moral weakness and apology will finally be broken. 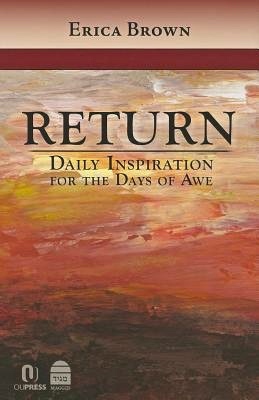 I have longed for a inspiring read for The Days of Awe and found that longing met in Erica Brown’s book – Return. – Rabbi Abraham Isaac Kook, Orot Teshuvah, The Lights of Repentance. Each chapter is based on a different verse of the Yom Kippur prayer Al-Het (for the sin that we have committed before you…). So meaningful for the times we find ourselves in. There are times I wish the chapter hadn’t finished quite as soon as it did but I realize that this books beauty is it’s brevity (just 149 pages) making it manageable to read in a ten day period. Drawing from Scripture and Rabbinic sources, this book will enlarge your understanding of teshuvah. 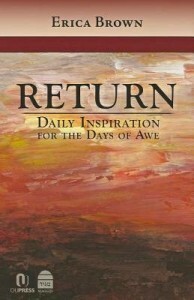 A precious and practical read for the Days of Awe, but full of wisdom for every day of the year. Sounds like one I need to read.